Purple Rock Scissors has an enormous, almost overwhelming slider where the content seizes the central stage. Small arrows that sit in the lower right corner, tiny graphics and lots of white space point out that the content has the first prerogative. It is hard to delineate boundaries of the slider, at least at first glance, since it ideally blends in, becoming an essential detail of the theme. 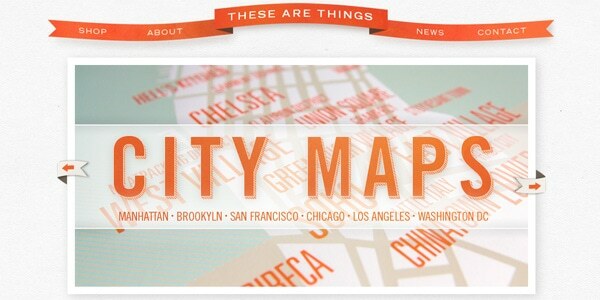 It is a bit content heavy, nevertheless, plain and clear arrows save users from getting lost. 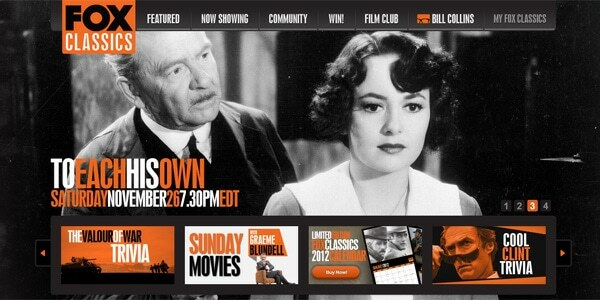 Fox Classics opts in favor of traditional image slider with an additional set of thumbnails on the bottom and tiny numeric buttons for navigation. It has a retro appeal and demonstrates skillful manipulations with color and typography that contribute to readability and make the component perfectly suitable for the layout. 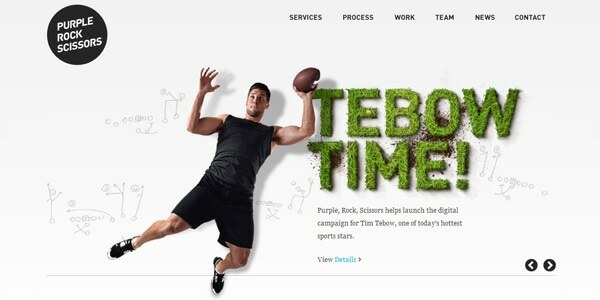 Converse adopts a sophisticated and intricate take on a basic slider that treats HTML content as a piece of art. With a grunge background, rough frames, extra ornamental details it gets a creative endeavor and looks simply exceptional. 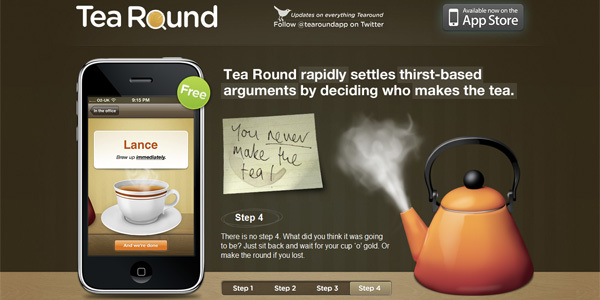 Tea Round App showcases the featured content through a skeuomorphic-inspired slider that enables users to read and navigate comfortably. Such tiny artistic details as a paper note, gradient buttons, handwritten type and sketchy objects are the main visual force. 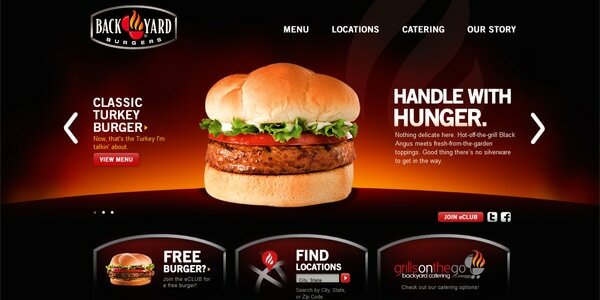 These are things’ has an elegant and fancy slider that matches the tone of the website. It incorporates distinctive traits such as ribbons, primary coloring, neat edges, clean borders and a subtle shadow. Light semitransparent wide stripe used for titles always stays in focus. 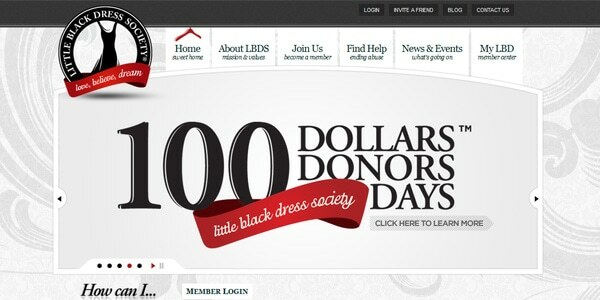 Little black dress’ slider helps engage users with relatively huge images and exquisite designs. An arc used as a top border paired with soft light coloring adds a required touch of femininity. The navigation bar presented, as usual, as a range of circles and additional play/stop/pause buttons for the infinite slideshow are nice features that are distinctive and well-marked. 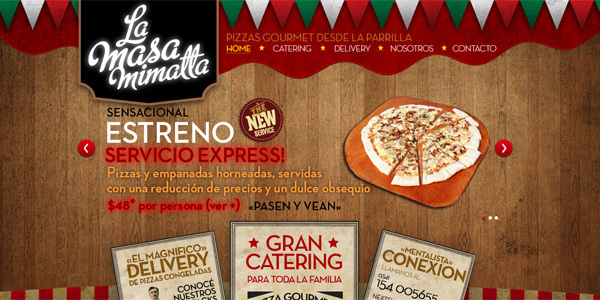 La Masa Mimatta’s slider meets the overall design theme and intensifies the content. The transparent background lets it feel natural and native. Text and image do not interfere with each other, establishing a focal point on the screen. If you feel the urge to familiarize users with the important content from the first seconds of their staying on the website then the slider can come in handy. It is easily perceived by users and in majority cases becoming the first component that seizes the attention. Although it does not cover a bulk of data, yet it dishes it up in digestible portions that is much more efficient. Moreover, like the owners of above-listed examples, you can always play with the design and layout, transforming it from simple plain box that just shows images into a masterpiece with a strong aesthetics and animation effects that liven up the content and strengthen the whole impression. However, you should always remember about the functionality and clear navigation tool.